Home › Home and Kitchen › Eco-Friendly Premium Stainless Steel Hot And Cold Bottle And Thermos 20 Oz Bp..
Eco-Friendly Premium Stainless Steel Hot And Cold Bottle And Thermos 20 Oz Bp..
ECO-FRIENDLY bottle is made of 100% food grade Premium 18/8 stainless steel. LEAK-FREE bottle is durable and will not spill even with shaking and movement. DOUBLE WALLED-VACUUM INSULATED to maintain either hot or cold temperatures throughout the day. WIDE-MOUTH design design allows for easy drinking and pouring and addition of ice. BPA-FREE bottle is SAFE for humans and environment and does not contain any toxins; and no metallic taste. 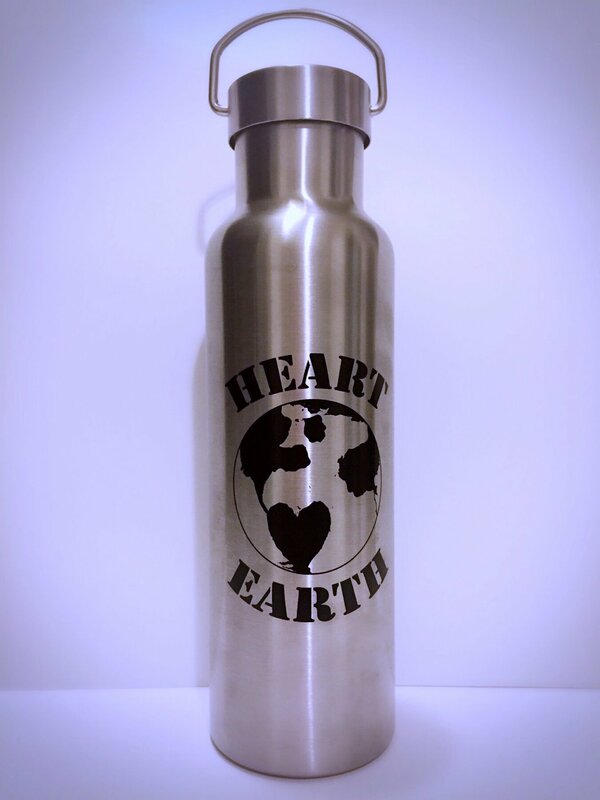 Our Heart EarthTM water bottle is inspired by our passion for protecting theenvironment while not compromising on quality. This might be the last waterbottle you will ever need to own. Our entire bottle including lid are made outof food grade PREMIUM- 18/8 STAINLESS STEEL. It is BPA free, lead free andfree of contaminants. Furthermore there is no metallic taste. Bottle will notrust or break and is extremely durable and can be used as a flask or thermosfor both hot and cold liquids. SAFETY- Many water bottles are advertised asBPA-free but this does not protect you from the many other chemicals thatplastic is composed of. Our bottles are 100% premium food grade stainlesssteel including the lids. There are no toxins that will transfer intobeverages hot or cold. VACUUM INSULATED- Double insulated vacuum wall keepsbeverages cold or hot up to 24 hours without sweating. Perfect for outdoorsand can be used for all seasons. ECO-FRIENDLY- Protect the environment and bemore responsible by refilling your water bottle and eliminate usage ofdisposable plastic bottles. LEAK PROOF- High quality food grade silicone ringensures that bottle remains leak-proof and will not spill regardless ofshaking or movement. HYDRATE- Stay hydrated throughout the day. It isrecommended that we drink half our body weight in water a day especially whenactive or during the warmer seasons. Our 20 oz bottle helps you easily keeptrack of water consumption throughout the day i.e. (160 lbs/2 = 80 ouncesdaily or 4 full bottles). CONVENIENT-Easily fits into most cup holders, bikeracks or backpacks. WIDE-MOUTH- Wide-mouth opening makes it easy to drink frombottle or fill with ice. Best of all we offer a LIFETIME 100% MONEY BACKGUARANTEE. Purchase one today and join the movement in raising awareness andplay your part in protecting the environment!